Decorate your tree with fun and colorful balls of Flarbles. Each ball contains 30 Flarbles and you can get the standard rainbow colors, or you may select your own combination of colors. 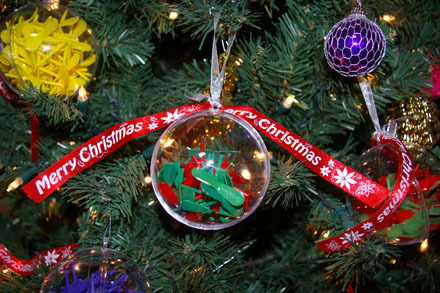 Purchase your Flarble Christmas Ball for $4.99. If you would like to be a retailer of Flarble®, fill out our Credit Application and fax it to the number indicated on the form. For retail pricing call 870-356-3523 or e-mail our sales representative Jennifer at . Send check or money order (Make payable to Rock Creek Molding) to 397 Rock Creek Rd., Glenwood, AR 71943 or call Jennifer or Gordon at 870-356-3523, please have credit card information ready. All orders will have a variety of rainbow colors. For color specific orders please call. Please allow 1 to 2 weeks for custom color orders. Add 5 cents per package for custom color combinations.